(CRISFIELD, MD – May 1, 2017) On Saturday, May 20, Crisfield Heritage Foundation members and the public are invited to the J. Millard Tawes Historical Museum in Crisfield, Md. to celebrate CHF’s 40th anniversary with the opening of a new exhibit entitled Battles of the Bay. Through a collection of maps, illustrations, and stories, the special exhibit shares the stories of Chesapeake Bay conflicts and their connection to the Crisfield area, including a 1635 naval battle on the Pocomoke Sound, Chesapeake pirates, and local conflicts in the Oyster Wars, among others. Local historian Joe Paden is curating Battles of the Bay, and will share stories of the heroes and villains of the exhibit with guided tours during the May 20 opening. These guided tours are free, with space limited, and will be offered on the hour from noon to 3:00 p.m., with sign-ups taken the day of the event at the Oyster Reef Gift Shop, located in the Tawes Museum. At 4:00 p.m., CHF members and guests are invited to the waterfront lawn of the Tawes Museum for live music and light refreshments, with the reception generously sponsored by Tawes Insurance and the Pizza Shoppe in Crisfield. A 50/50 raffle will take place at the reception, with proceeds benefiting CHF. In the event of rain, the reception will move inside to the Chesapeake Room, located on the second floor of the museum with sweeping views of the marina. The exhibit continues through May 31, 2018, and is open during Museum and Oyster Reef Gift Shop hours, which are 11:00 a.m. to 4:00 p.m., Thursdays through Saturdays, now through Labor Day, with other hours as announced for special events and educational programs. The Crisfield Heritage Foundation’s mission is to preserve the heritage of Crisfield and its environs; to educate the public concerning this heritage; and to serve as the central hub around which tourism in the Crisfield area revolves. CHF’s entities include the J. Millard Tawes Historical Museum, Oyster Reef Gift Shop, Ward Brothers Workshop, J. Millard Tawes Library, Cedar Island Marsh Sanctuary, and the Crisfield Customs House. The second floor, waterfront Chesapeake Room at CHF’s Tawes Museum is now available for private rentals, with more information at 410-968-2501, or by visiting the non-profit’s recently updated website at crisfieldheritage.org. On Saturday, May 20, Crisfield Heritage Foundation members and the public are invited to the J. Millard Tawes Historical Museum in Crisfield, Md. to celebrate CHF’s 40th anniversary with the opening of a new exhibit entitled Battles of the Bay. 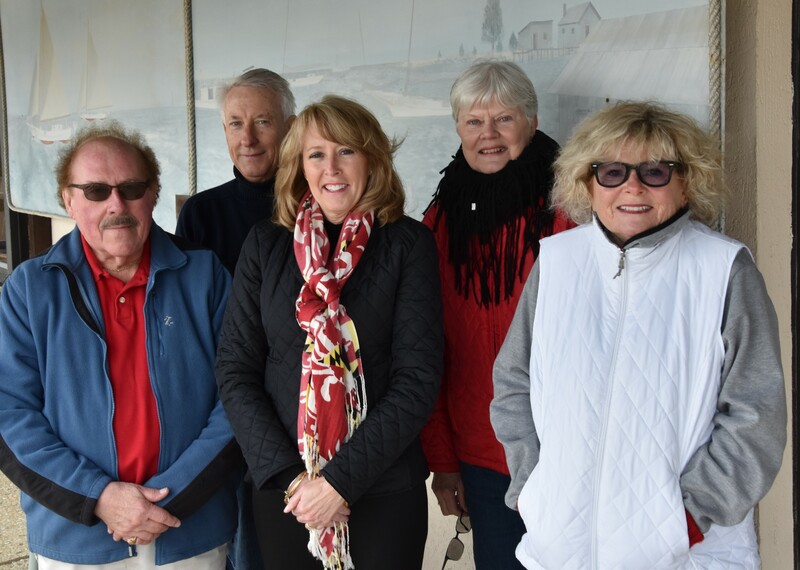 Free guided tours will be offered on the hour from noon to 3:00 p.m., with sign-ups taken the day of the event at the Oyster Reef Gift Shop, located in the Tawes Museum. At 4:00 p.m., CHF members and guests are invited to the waterfront lawn of the Tawes Museum for live music and light refreshments, with more information at crisfieldheritage.org. (CRISFIELD, MD – March 13, 2017) On Saturday, March 4, a new sign featuring the Ward Brothers and proudly announcing the “Home of the Ward Brothers” was installed along Crisfield’s entrance corridor. Sponsored by the Crisfield Heritage Foundation and financed by a grant from Crisfield’s American Legion Post 16, this new sign replaces one that had deteriorated on the same site for more than 15 years. The back of the sign includes a picture of the depot with a greeting to all departing Crisfield guests, “Thanks for Visiting, Come Back Soon.” Built by local sign maker Becky Lowe of “Brushworks,” the new sign was installed with the help of CHF Executive Board members Doug Crockett and Terry Pehan. CHF continues its focus on promoting the unique cultural and heritage tourism of Crisfield and nearby communities. The original Ward Workshop on Crisfield’s Sackertown Road is available for tours by appointment by calling 410-968-2501, and on special dates announced by CHF. The Crisfield Heritage Foundation’s mission is to preserve the heritage of Crisfield and its environs; to educate the public concerning this heritage; and to serve as the central hub around which tourism in the Crisfield area revolves. CHF’s entities include the J. Millard Tawes Historical Museum & Gift Shop, Ward Brothers Workshop, J. Millard Tawes Library, Cedar Island Marsh Sanctuary, and the Crisfield Customs House. The second floor, waterfront Chesapeake Room at CHF’s Tawes Museum is now available for private rentals, with more information at 410-968-2501, or by visiting the non-profit’s recently updated website at crisfieldheritage.org. Crisfield Heritage Foundation Treasurer Doug Crockett, left, works with Brushworks sign-maker Becky Lowe, right, to install a new “Home of the Ward Brothers” sign along Crisfield’s entrance corridor. Sponsored by the Crisfield Heritage Foundation and financed by a grant from Crisfield’s American Legion Post 16, this new sign replaces one that was on the same site for more than 15 years. CHF’s entities include the J. Millard Tawes Historical Museum & Gift Shop, Ward Brothers Workshop, J. Millard Tawes Library, Cedar Island Marsh Sanctuary, and the Crisfield Customs House. On Saturday, March 4, a new sign featuring the Ward Brothers and proudly announcing the “Home of the Ward Brothers” was installed along Crisfield’s entrance corridor. (CRISFIELD, MD – September 2, 2016) On Saturday October 1 from 2:00 p.m. to 5:00 p.m., the Crisfield Heritage Foundation is hosting a “Pick & Shuck” crab and oyster feast on the waterfront lawn of the J. Millard Tawes Historical Museum in Crisfield, Md. Along with live music, guests will enjoy steamed local crabs, shucked oysters, beer, wine, and other foods and drinks. Volunteers from the Crisfield Police Department will be grilling oysters for the waterfront event, which also features a 50/50 raffle and door prizes, including a Smith Island Cake. Tickets are limited to the first 100 people, with all proceeds benefiting the Foundation and its entities, including the Tawes Museum, Ward Workshop, and Cedar Island Marsh Sanctuary, among others. Local businesses are supporting the fundraiser through generous in-kind and cash donations, and will be acknowledged at the event. Tickets are $40 per person, and include live music and a menu featuring raw and roasted oysters on the half shell, steamed crabs, corn on the cob, hot dogs, beer, wine, soda, and water. In the event of rain, the crab and oyster feast will be moved under the large pavilion at Somers Cove Marina. Tickets can be purchased at the J. Millard Tawes Historical Museum in Crisfield, Md. during business hours, or by contacting Event Chair Mary Ann Peterman at 443-783-3619. The Crisfield Heritage Foundation’s mission is to preserve the heritage of Crisfield and its environs; to educate the public concerning this heritage; and to serve as the central hub around which tourism in the Crisfield area revolves. For more information about CHF, call 410-968-2501. The Crisfield Heritage Foundation is hosting a “Pick & Shuck” crab and oyster feast on Saturday, October 1 from 2:00 to 5:00 pm. The fundraising event takes place on the waterfront lawn of the J. Millard Tawes Historical Museum in Crisfield, Md. with tickets limited to the first 100 people. Tickets are $40 and include live music and a menu featuring raw and roasted oysters on the half shell, steamed crabs, corn on the cob, hot dogs, beer, wine, soda, and water. In the event of rain, the crab and oyster feast will be moved under the large pavilion at Somers Cove Marina. For tickets and more information, contact Event Chair Mary Ann Peterman at 443-783-3619.